Supportive leadership invites IoT and wearable industry to make its marks. Wearable electronics startups and companies seeking to be leaders in the industry will find Greater Phoenix provides many assets and resources to succeed, as well as the ability to easily assimilate into both the corporate and community environments. The region touts itself as “The Connected Place,” fostering an environment where expanding technology businesses thrive. Companies with a presence in the Phoenix metro such as Medtronic, Garmin and NXP Semiconductors are making investments in wearable electronics, both in military and healthcare applications, says Chris Camacho, president & CEO, Greater Phoenix Economic Council. Young companies, including NeoLight, are breaking out in the space, Camacho says. The Phoenix area’s wearables electronics industry and stakeholders are taking the industry to the next level. “GPEC has been trying to convene a network of folks interested in sensors, broadly speaking, which will be a part of any wearable electronics technology, whether it is for sensing motion, orientation or more exotic things,” says Nick Colaneri, director, Arizona State University’s Flexible Electronics and Display Center. “The flexible electronics area is still an emerging technology where there is more discussion about wearable devices, medical devices or otherwise, as well as the Internet of Things and how those devices could be connected to help people,” says Todd Hardy, vice president, ASU University Realty, and the senior economic development adviser, ASU Knowledge Enterprise Development. “The initial move in this space (in Phoenix) was largely centered around the Flexible Electronics and Display Center at ASU in Tempe, leveraging the competency into a $100 million grant with the Army in applied research and flex communication devices that were going to support troops in the Middle East,” Camacho says. A decade ago, ASU formed a consortium to look at issues associated with making flex screen displays a practical manufacturing proposition, Colaneri says. While the original project for the Army has since wrapped up, the infrastructure and industrial partnerships have led to other projects, including a current project centered on a device for taking digital X-rays of suspicious objects. In addition to ASU’s recognition as the nation’s No. 1 innovative university by U.S. News & World Report, the university also has resources and workforce solutions such as land “we can use to develop facilities that could be valuable for the companies to be connected with us physically,” Hardy says. SkySong, located in Scottsdale, is a 1.2-million-sq.-ft., Class A office development. Companies will also find they can easily position themselves as leaders in the community. Camacho mentions a new entry to the Phoenix market, Kudelski Security, a cybersecurity company which is taking leadership roles in the metro. Based in Lawrence, Kansas, Duran most recently served as the editor in chief of Business Xpansion Journal for 15 years; she also served as editor of Global Corporate Xpansion for 14 years. Since 2000, she has interviewed hundreds of corporate executives, economic developers, government leaders and higher education officials to tell the story of business expansion and the economic trends influencing a variety of industry sectors and all world territories. A self-confessed foodie, dog lover and outdoors enthusiast, Duran graduated from the University of Kansas School of Journalism with a minor in history. When not working, Duran can be found riding her bicycle in northeast Kansas. 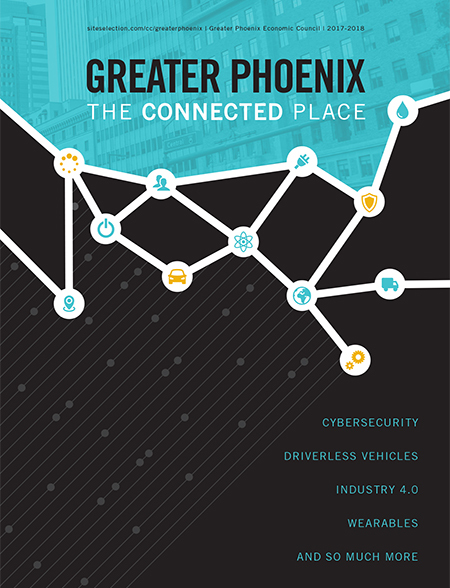 Greater Phoenix continues to prove The Connected Place can close the gap between technology, talent and opportunity.